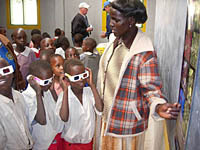 In July of 2006 the Paper Project had the opportunity to travel to Kenya. Through a series of fortunate circumstances we were able to tag along with Barry Wilkens from the Center for Solid State Sciences at ASU and his photographer companion, Jabel Busl, to the village of Lolgorian Kenya. 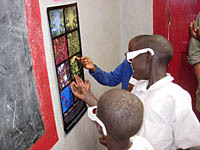 Although we were only able to travel in the virtual sense, six unique Paper Project posters along with six sets of 3D glasses made the trip and remain in the classrooms today. 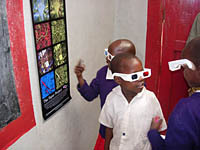 Considering these schools have no technology, these images provided an opportunity for the students to explore the microscope world of paper and to experience 3D images. 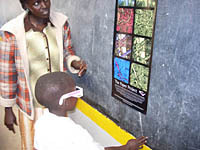 Below are some of the images, and coming soon video, showing the excitement of the children viewing the images. Our special thanks to Jabel Busl for permission to use his images on our web site. Click on the images to see larger versions, or click her for a video. 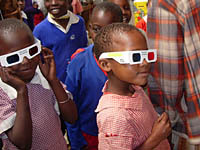 Barry said that all the children were fascinated by the images, especially the 3D images. 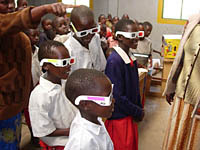 Although none of the children spoke English, they all knew how to say "3D," when they saw Barry later in the trip. 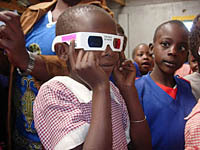 Students are introduced to 3D images and the technology behind the Paper Project. 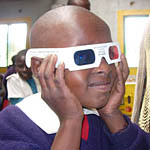 The simple poster and sets of 3D glasses make a powerful impression in classrooms that have no electricity and very limited resources.